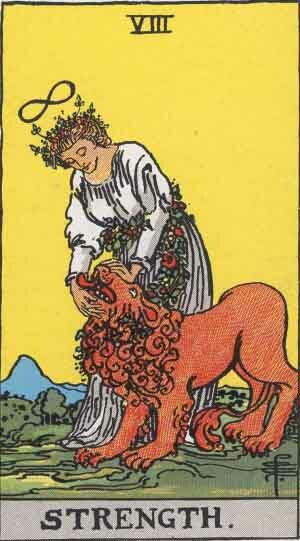 The Strength tarot card is ruled by The Sun (Leo) but it also has a Plutonian (Scorpio) vibe to it as well. The two signs (Leo and Scorpio) square off and are fixed, and in this image we see the Lion being subdued. Which reminds me that one must submit to a Scorpio or get out of its way — there’s not must choice in the matter. Scorpios are in it to win and Leos really don’t stand a chance, sad to say, without breaking their heart. So the Strength card can suggest bending to the will of another, subjugating and submitting to a pure substance or a force greater than oneself. And while Scorpios get a bad rap (and for good reason!) they can be here to teach, transform, and purify the crazed soul within. 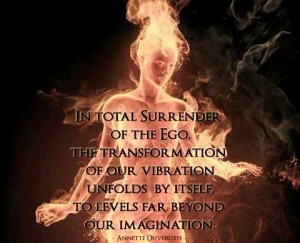 If you bow down, they’ll show you their softer, transformational, and healing side. So you can either die or cry when the will of Scorpio (Pluto) is being exerted upon you. Respect is something Leo’s are strong on but it’s important for all of us (our Suns, and especially Leo — being domicile with the Sun) to respect the will of others too. Pluto forces us to get over our egos (the Sun). It always requires we acquiesce, and not fight. With your transits, solar return, or natal chart, Pluto forces us to confront that which we do not want, is not comfortable, is against our every sense of what’s right and just. You can manifest positive change or choose to be on cruise control or aut0-pilot (which I don’t suggest as that manifests as unconscious compulsions). You can succeed (acquiesce) or fail (fight back). My suggestion is for you to introspect on what you’ve being given and then let go, give in, stop fighting. When you do that, you will see the light and become all shiny and new again – there are gifts in genuine strength — have the strength to fall-back. Want to know more about the meaning of the Strength card? Check out my Tarot Card Meaning.